ActiveSync is hardly a new topic on this blog. And once more I’ll be looking into an aspect of it, that I don’t believe I’ve covered in detail before. Let’s start a little easy, and see if we end up with some more knowledge of how to test/debug/play with Exchange ActiveSync. I am making the assumption you are already aware of the basics like setting up devices and installing servers. For some strange reason you need to establish a partnership before you can read out which version your device supports. Sort of silly if you ask me, but I didn’t find any other key. Maybe it’s intended to reflect the version in use, as negotiated with the server, and not what the device is capable of. Well, clever me for finding my way through the registry I suppose… It doesn’t offer much value knowing this by itself. But a not uncommon issue I encounter what with Apple, Nokia, and everyone implementing ActiveSync is knowing what is actually implemented. Oh, sure, you can sync. But can you sync tasks? Or text messages? If in doubt ask the vendor which EAS version they support. Now I do not know the meaning of all of these commands by heart (Microsoft has them documented on MSDN), but for instance “SmartForward” means the ability to receive a mail with an attachment, and forward it with the attachment intact, without needing to download the attachment to the device and upload to the server first thus saving some traffic on your data plan. These commands are used in the HTTP POST the device communicates to the Exchange Server. More on that later. Some of the other registry values are fairly self explanatory, and I’m not digging into these, you will be able to figure out some on your own 🙂 While you can usually always (seemingly) modify a value it might be that you’re not really editing it, as some keys may very well be a read-only representation of a setting stored somewhere else. If this is the case you probably do not have easy access to modify the source. If you get the 501/505 error it means that ActiveSync is responding, so it’s not worthless but it’s not telling you a lot either. It is one of the first things I check when I’ve configured ActiveSync on a server – because if you’re not getting this response something might be wrong. There’s two parts to building this request; the POST string, and the request headers. Let’s look at the string first. DeviceId – A unique id for the device that is synchronizing. DeviceType – An id for the device/model you are using, or the ActiveSync client. User-Agent – The user agent of the HTTP client; could be MSFT-PPC/5.2.5300. Authorization – A base64 encoded string formatted as such (before encoding) domain\username:password. 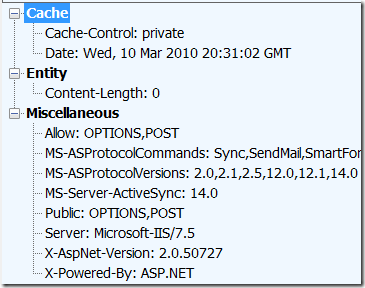 MS-ASProtocolVersion – The client version of ActiveSync. Set to 14.0 in our example. If you get a 403 error check that the username&password combo is correctly encoded. – It’s WBXML so you’ll need to decode it to something readable. The sync shown above is just a quick connectivity test – it does not explain how an actual device would interact with Exchange. You might say I started in the wrong end, but in troubleshooting you often try the easy things first before you go all in. While the HTTP 501/505 will identify issues DNS errors, SSL trust issues, and general reachability of the server, the HTTP 200 response (or lack thereof) might identify application level issues. OPTIONS is one of the things that the Exchange Remote Connectivity Analyzer tests, and it’s not entirely uncommon for this to fail in some scenarios. You don’t configure this on your Exchange Server, and it’s not likely you did something wrong installing your Client Access Server. But some firewalls with tightened security might block the OPTIONS keyword/method. ActiveSync clients may or may not work properly if OPTIONS is blocked (implementation specific). A symptom might be that you’re not able to use all the features your Exchange version provides. So what should you expect as the response? Well, this would be dependent on which Exchange server you happen to be querying. 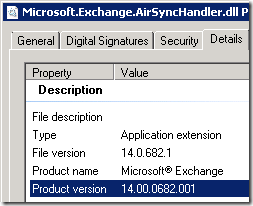 There are currently three Exchange releases that support ActiveSync – Exchange 2003, Exchange 2007 and Exchange 2010. 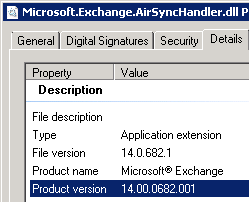 (Exchange 2003 requires Service Pack 2 for DirectPush, but supports EAS in RTM. Not that I know of many 2003 deployments without SP2…) Exchange 2003 provided a rather lackluster selection of policies that you could implement. Exchange 2007 improved on this and also introduced the concept of non-provisionable devices meaning devices that are not able to implement the desired policies. 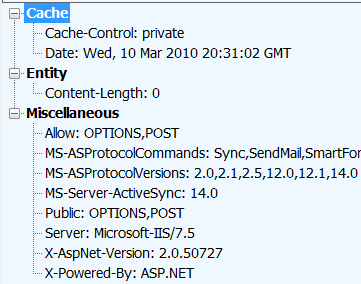 With Service Pack 1 for Exchange 2007 came the requirement that you could not activate ActiveSync for a user without defining a policy (in RTM this was optional). The policy could be “empty” in the sense that you didn’t actually set any policies, and I think you might be able to “hack” your way around it with PowerShell, but proper behavior is to have a policy. Exchange 2010 doesn’t really add much in the policy department as compared to Exchange 2007, and works similar for the scenario we are playing out. Here’s where it get’s funny. The next thing is that there are some requests and responses going back and forth asking for the provisioning xml. The device then tries another “FolderSync” after it has pulled down the policies. If you have disabled the “allow non-provisionable devices” setting Exchange will say “hold on there boy, have you actually implemented the policies I sent you?” The device will hopefully say yes, and the command will be processed server side. (There are some details I’ve left out – like some simple “keys” generated so you can’t hi-jack the session, but these details aren’t relevant for the bigger picture.) This is entirely an issue of trust, and Exchange cannot actually check if the policies have been applied. So let me re-phrase this behavior in other words: If I do not like your pesky policies, I can implement a client that will always respond that policies are ok regardless of whether the device supports them or not. I can ignore them completely! – An MDM solution that will handle management of devices. This includes policy enforcement. – An ISA/TMG server, ISAPI filter or something similar that will inspect what kind of devices are trying to synchronize the data from the Exchange server. What you get in return from the server after we have played the policy charade will still be in the user-friendly wbxml format, but you will be able to recognize item types you’ve got in your Outlook if you inspect the response. The names will be localized to your chosen language – not sure which variable controls this server side, but that’s an Exchange thing. Going further from here you can use other commands too like sending mail, etc. While that is a nice thing, it is a bit further than I planned at the moment since the intention of this article was to provide some background for a deep dive troubleshooting session if you ever run into a tricky ActiveSync issue. It also works, (in my opinion), as a primer for understanding the ActiveSync protocol, and not just the configuration & setup bits. – WireShark (www.wireshark.org) can parse wbxml if you want to sniff the traffic. It might not be what you’re likely to read as bedtime stories, but it does provide pretty much everything MSFT will release to the general public for the time being. You’ll be interested in the ones starting with “MS-AS”. I know I indicated a couple of paragraphs ago I resorted to using Fiddler only for inspecting the traffic, and actually creating the requests in code. And you might be feeling that leaves some of this as a theoretical exercise since I didn’t provide an app. Theory will only get you so far, and actually being able to test it proper provides a greater value for most people. I do apologize for that, but I felt that mixing in code in this article would possibly make it less understandable/readable and scare away the non-programmers. I am working on this separately however, and I’m looking to release some sort of utility to help you along the way. This post is very useful for the development purpose. I would like to ask a query in this regard. As per the specification document [MS-ASCMD].pdf, using sync command [2.2.1.19.1.6 Add] we can use the “Add” operation to add one item from client to the server. But it is explicitly mentioned in the document that “The element cannot be used to add any e-mail items from the client to the server”. I have not tested this (yet) so I do not know what happens if you try to do this. What I assume MSFT might be making references to is the fact that mail should not be sent through this command. (This requires SendMail as per 2.2.1.15.) It is not recommended to store items directly to the “Sent Items” folder, and this behaviour is present in Exchange Web Services too to my knowledge. The “Drafts” folder should be treated as any other folder I guess. But always add the items client-side, and not directly to server-side. Exchange and ActiveSync doesn’t differentiate between email and other items on the database level. If it’s a mail item or a calendar item is just an attribute. The “Add” command will not let you add MIME-formatted data as the “SendMail” command requires either so you can’t add emails in that sense. Thanks for the informative article. I was asked to set up monitoring using nagios for our exchange server, specifically the active sync portion of it, and the information you presented here enabled me to do (somewhat) better than just seeing if I got a web response. Specifically, using the information you presented I’ve implemented a system that uses the OPTIONS method as illustrated in your article to query the server for the AS version running. Thanks! And this is when testing with Fiddler? What version Exchange are you testing against? I have just done a test against my Exchange 2010 SP1 box, and get the same error. This might be related to a similar error I am seeing with Exchange 2007 SP2/SP3. I am investigating if there are some changes in the EAS protocol that I am not aware of. I tested against Exchange 2007 and Exchange 2003. I tested using both Fiddler and a C# client that sends the data via a POST message. In both cases I see the same error. I wasn’t able to reproduce it on my E2K10 box again – possibly due to tweaking some other things there. For Exchange 2003 the value is 2.0 or 2.5 if I remember corrrectly. I haven’t tested on a 2003 server though. Setting the incorrect protocolversion might cause issues like this. I was really happy to find your article! I was spending last days trying to get my Acer Liquid synchronize with my office EAS server. All I was able to get – is Error 500 in response. I know my colleagues were able to Sync easily using their iPhones, and other phones. But there is only me who is trying to use Android. Unfortunately I will not be able to get any kind of support from our IT support, so I need to dig it myself. The bad thing is that I already tried 3 different 3rd party softwares on my Liquid – and nothing was working. What I am thinking of – maybe if someone have a Playground Exchange – I can try to login from both phones and compare data exchange to understand what my phone communicates wrong? Maybe you have such server? There are providers offering hosted Exchange, and while I am not aware of any free Exchange servers there might be some free trials. Unfortunately it doesn’t really tell much about why it’s not working with your Exchange server at work since there are a number of possible configurations of the server. While your IT department will not be able to support you I suppose they can check basic things like whether your account is allowed to sync, and whether they are trying to apply any policies which can cause some devices to fail. Error 500 can be related to both the device, the user account used, and the server and can be difficult to track down. I don’t know if you have tested my EAS diagnostic tool? (Available in the downloads section.) You can check if you get any useful output with that and report back. Test first without checking “Provisionable” and “Support security policies”, and then check those two boxes as necessary afterwards. If you get error 142 when both are checked just change the device id. I tried to make search request to Exchange server by EAS protocol but i’m getting Numeric number 3 in response. what is reason? how to solve please help me. I’m working on Android(java), tried to make email search request to Exchange server by EAS protocol but i’m getting Numeric number 3 in response, but same code is working for GAL(Global address lookup)as store name but not for store name as a Mailbox, what is reason? how to solve please help me. I haven’t tested out searching for mail, so I don’t have any personal experience on this one. I assume you’ve read through the documentation at MSDN? I’m trying to build an ActiveSync library and am currently stuck at the first try to send the wbxml code. Apparently Exchange is terminating the handshake because it doesn’t recognize my request code. Comparing it with your wbxml example, I see that you don’t send the actual codes as defined in the FolderHierarchy codepage, but add 64 to them. Can you explain why? Because 64 is a magic number? I can’t remember the link to the msdn page I used as reference material. But the initial FolderSync is an “empty” sync request. You don’t need to include the folder hierarchy, (this is part of what you’re interested in acquiring), and since you haven’t synced before you don’t have a sync key either. So the first sync key is 0, and you know that the max length of the sync key is 64 characters. This is just the way my initial wbxml works out I guess – not able to give a better explanation at the moment. Your xml was filtered out by the WordPress commenting system which doesn’t allow that kind of text so I’m not able to compare notes on that part. Actually, the 64 is 0x40, ie bit 6 on. This is defined in the WAP Binary XML spec: http://www.w3.org/1999/06/NOTE-wbxml-19990624/#_Toc443384904 (I don’t see it anywhere in the MS-ASWBXML doc on MSDN). Without bit 6 on (ie, sending 0x16 instead of 0x56) you’re telling Exchange that there’s no content in your element, which isn’t true, so it rejects the request. Thanks for the detailed explanation.I would like to ask something. For EAS, I want to download the headers only(not body of the mail).So which command i shall use or else what is the way to download the headers only. I am also getting a 400 Bad Request Error. We are using EXCHANGE 2007 and the supported ASPProtocolVersion based on your OPTIONS strategy shows that 1.0…12.0,12.1 are supported. I used this in the POST headers to the server and still get 400 BAD Request. Is this hand-crafted with Fiddler? I’m not sure why, but Exchange does not always seem to like POST requests with a content-length of 0. (Zero-length POSTs serve no purpose though…) If you’re testing with Fiddler it seems the GET is the only test that will give you the basic info you want for verifying that the server is online (in addition to using OPTIONS of course). For further tests I recommend my EAS MD utility available in the downloads section – you can inspect the results in Fiddler of course. There’s also source code available if you want to implement your own tools. Very helpful. But for me, the EAS MD applicaiton gives an “Unhandled Exception error” when I run the Full Sync test. Index out of range. Parameter Name: index. The EAS MD gives me 382 bytes of proper folder hierarchy. All data seem to match on the wire. Nice post , I am also trying to work with activesync in android and stuck at the meeting part. Is there any chance you can help me here. I have only performed quick investigations into the calendar syncs previously, so I can’t tell you exactly what a good entry looks like (without sniffing the traffic on the wire from a known good client). I have considered doing a post on calendar sync, and produce code for it, but I haven’t gotten around to it yet. Thanks for helpful article.I am new in this filed and have gotten a active sync project recently . the server and client are working good in mail but when server read a unread mail ,the client does not change but when client read a unread mail the server shows changes. clazz is [Email] so we query db for SyncOption. I have no idea for that I hope you could guide me for this.